#OHL 2015-16 Coaches Poll Winners: How did the Barrie Colts do? - Very Barrie Colts | A website covering the Barrie Colts of the OHL. Home Andrew Mangiapane Barrie Colts blog Coaches Poll Kevin Labanc Mackenzie Blackwood OHL #OHL 2015-16 Coaches Poll Winners: How did the Barrie Colts do? 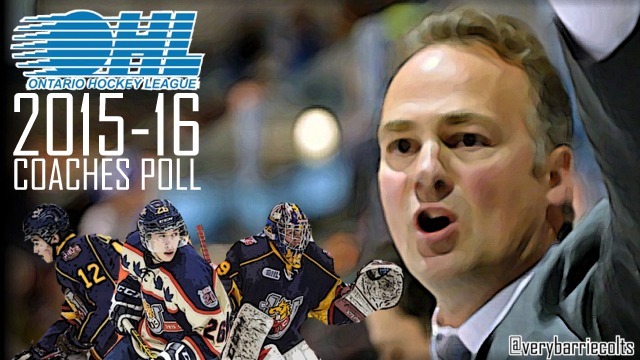 #OHL 2015-16 Coaches Poll Winners: How did the Barrie Colts do? Yesterday the Ontario Hockey League announced the winners of the 2015-16 Coaches Poll. This poll is made to give coaches around the league the chance to recognize 3 different players from each Conference over 20 different categories. So how did the Barrie Colts do? Barrie showed up in 16 of 20 categories with 8 different players representing them. This is the most appearances of all teams. Here is a look at how they did. *We will just be sharing the categories that a Colt made. Click here to see the full list at the official OHL website. Also note that below is just the standings for the Eastern Conference and has the order and final vote total.